Chelsea Flower Show goes (Lower) Austria: Staying at one of Austria’s top garden B&Bs. Imagine you find yourself in a garden. Not just any garden, no. A garden full of light and life. It’s the middle of the summer, and bees are humming, a butterfly lands on your shoulder, tickles you ever so gently on your skin. Swaying gently in your hammock, you close your eyes and forget all about the world … Later, when you open them again, you watch your host do some gardening in the back. Now your hands dip into the cool swimming pool, and you start humming a soft melody together with the chirping birds. As the smell of freshly baked apricot cake meets your nose, a smile starts spreading all over your face. “Good morning, dear Elena”, Petra greets me warmly as she opens the door to the terrace and spots me right there in her garden. My feet, dewy and happy from my morning walk through the garden, carry me to her and the promise of a delicious, home-made breakfast. It is, my dear, one of those moments when you realize there is nothing else to do. Except to be right there, in the here and now, and to enjoy. “So you’re gonna eat all of that?”, my mum muses at the breakfast picture I have sent her. A good hour later, I am still sitting at the breakfast table, trying to sort through my emotions and memories of the day. Here in Scheibbs, at the foothills of the mighty Ötscher mountain, one of Lower Austria’s largest at just under 2.000 metres tall, the clocks tick just a little slower I find. Spellbound by the peace all around me, I take to reading late into the night (the guest library welcomes you to choose any book you’d like), venture out to explore the local town of Scheibbs, or just sit back and relax the garden paradise around me: “I can only imagine how the enthusiasm of your guests at your beautiful garden encourages you to do even more work on it … You know, you have really been able to translate the idea of a Chelsea Flower Show type garden into the garden language of Lower Austria – beautiful, and local”, I add speaking to my host Petra Schabl-Zehetner. “Thank you so much, dear Elena!” Petra’s eyes glisten as she leads me, son in hand, through her entire Bed & Breakfast mansion. There is a room, or rather, an entire apartment on the upper floor of the building, that I never want to leave again: This is how comfortable and welcoming it looks to me upon first sight. Sweet little messages, full of wit and thought, are displayed everywhere, most of them in English. Petra has a real knack for garden deco stuff, elegantly striking the balance between kitsch and class. Let me take you by the hand and lead you right in hecking out the famous “garden paradise”! 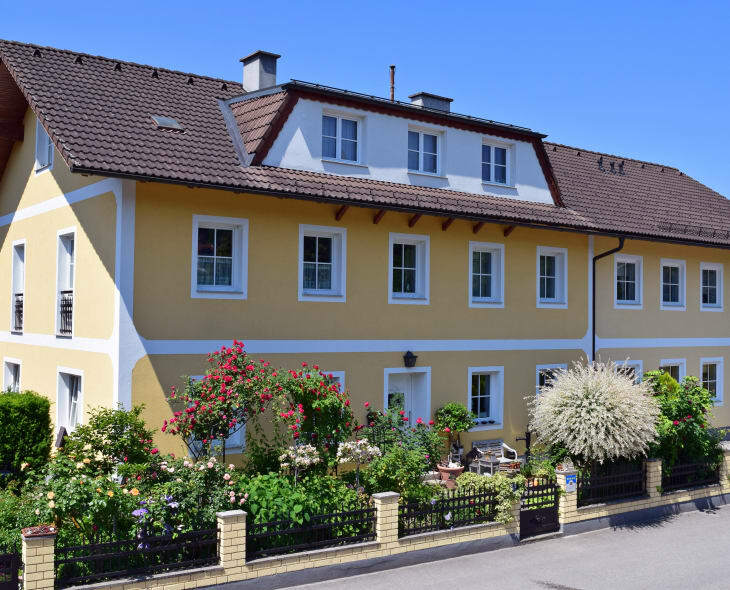 Come & meet the family Schabel-Zehetner in Scheibbs their beautiful terrace and garden and how’s that for accommodation right inside one of Lower Austria’s most beautiful mountain districts? You can easily imagine to sleep really well here. The city of Scheibbs, too, has made a point of cultivating its own local herb garden right inside the old town and yes, there is even an American Burger bar, offering me this delicious little wrap with a view of the river and city at night! Before you leave, Petra will also have a bottle of local plum liqueur to give to you dear Petra, dear family : I’ll be back, that’s for sure!